Keyless entry systems or electronic key fobs for vehicles has been standard now for decades, but now there are automobiles that operate with something called a transponder key. What is transponder key and how do they work? More importantly, what do you do if you need a replacement transponder key? The term transponder is made up of two words, “Transmitter” and “Responder”. The transponder key fob transmits a signal that is received and responded to my a receiver inside your vehicle. In newer vehicles, there is no need to insert a key into an ignition and turn the key to start the car. There is keyless electronic ways of doing this instead. As long as the transponder key is in your hand or pocket, you simply step on the brake and push the button to start the car. If you are trying to open a car door or lock them, you press the button on the key fob. They operate on a remote electronic signal and function only when charged with a battery. The key fob for the transponder key has a small short range radio transmitter inside that communicates with the corresponding receiver inside your vehicle’s locks. When you push the button on the key fob, it sends a brief signal to the vehicle to signal whether you want to lock or unlock the doors or start the ignition. Some transponder keys are programmed to encrypt and rotate signal codes to make it more difficult for car thieves to intercept and duplicate the signal to gain access to your automobile. What happens when you need a new battery in your transponder key? 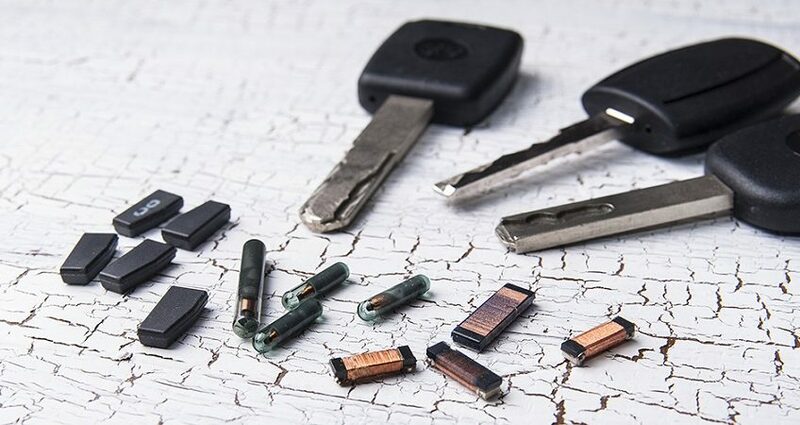 You follow the steps to replace the battery which usually mean opening up the key fob, buying the proper size of battery, removing the old one, replacing it with a new one and reassembling the key fob unit. Sometimes, an extra step of reprogramming the transponder key is needed. With the exception of classic cars or those made before electronic key technology, gone are the days when all you needed to open up a locked vehicle was a coat hanger and time to patiently jiggle the lock open. While transponder keys make a vehicle more difficult to break into or steal, when you lock yourself out of your automobile that operates with a transponder key, you need to take other measures of getting back inside. If you have lost your transponder key, you will need to get a replacement which will require programming. A qualified automotive locksmith is able to do this for you and typically charges much less prices than those your car dealership will charge. A locksmith is also able to handle repairs to the inside of your transponder key fob such as re-soldering components that work loose. When you want to know what is transponder key and how to get one reprogrammed, it is time to contact a knowledgeable locksmith technician who will be able to answer all of your key questions and get your key programmed on the spot.